"Ghostory" redirects here. For the album by School of Seven Bells, see Ghostory (album). Monogatari (物語, lit. "Story") is the general name for a series of Japanese light novels written by Japanese novelist Nisio Isin and illustrated by Taiwanese illustrator Vofan. Kodansha has published 24 novels since November 2006 under their Kodansha Box imprint, with at least five more novels planned. The story centers on Koyomi Araragi, a third-year high school student who survived a vampire attack, and finds himself helping some girls involved with all kinds of apparitions, deities, ghosts, mythological beasts, and spirits. Shaft has animated the Monogatari series multiple times since 2009. Its first season consists of 3 story arcs with 30 episodes produced from 2009 to 2012. The second season contains 6 arcs across 28 episodes animated between 2013 and 2014. The third and final season containing 5 arcs with 42 episodes was released from 2014 to 2019. An anime film trilogy was also released in 2016 and 2017. A manga adaptation by Oh! great began serialization in Kodansha's Weekly Shōnen Magazine in 2018. The Monogatari series revolves around Koyomi Araragi, a third-year high school student who is almost human again after briefly becoming a vampire. One day, a classmate of his, the reclusive Hitagi Senjōgahara, falls down the stairs into Koyomi's arms. He discovers that Hitagi weighs nothing, in defiance of physics. Despite being threatened by her to keep away, Koyomi offers his help and introduces her to Meme Oshino, a strange middle-aged man living in an abandoned building, who cured him of being a vampire. Once Koyomi helps solve Hitagi's problem, she decides to become his friend. As the series progresses, Koyomi finds himself involved with other girls, each afflicted by different "oddities", including the ghost of a child called Mayoi Hachikuji; his underclassman Suruga Kanbaru; Nadeko Sengoku, a friend of his sisters; his classmate Tsubasa Hanekawa; and his own younger sisters Karen and Tsukihi. To deal with the spectres, Koyomi relies on guidance from Oshino and, later, from Shinobu, the same vampire who attacked him, now with the appearance of an eight-year-old girl. Most heroines have an item that symbolises their spectres, such as Hitagi's stapler (the claw of a crab), Mayoi's backpack (the shell of a snail), Suruga's arm (the arm of a monkey), Nadeko's hat and jacket (the head and skin of a snake), and Karen's black and yellow suit (the colors of a bee). Although incorporating elements of fantasy, horror, and action, it primarily focuses on conversations between characters, containing parodies of other series, as well as Nisio Isin's trademark word play and metahumor. The Monogatari series was first created by Nisio Isin as a series of short stories for Mephisto magazine. While his previous Zaregoto series featured large casts of characters, each Monogatari story tends to introduce only one new character. The previously published stories of Bakemonogatari, and some new ones, were eventually collected in two volumes as part of the Kodansha Box launch titles in 2006. The first volume Bakemonogatari (化物語, "Monster Story") contains three stories titled "Hitagi Crab" (ひたぎクラブ), "Mayoi Snail" (まよいマイマイ) and "Suruga Monkey" (するがモンキー); the second volume comes with two additional stories titled "Nadeko Snake" (なでこスネイク) and "Tsubasa Cat" (つばさキャット). A prequel to the series, titled "Koyomi Vamp" (こよみヴァンプ), was published in the first issue of Pandora magazine. It was later released as a separate volume in 2008, titled Kizumonogatari (傷物語, "Scar Story"), followed by Nisemonogatari (偽物語, "Fake Story"), which was divided into two volumes released in 2008 and 2009: the first containing "Karen Bee" (かれんビー) and the second "Tsukihi Phoenix" (つきひフェニックス). The first volume of Nekomonogatari (猫物語, "Cat Story") released in 2010, subtitled Kuro (黒, "Black"), contains another prequel to Bakemonogatari, titled "Tsubasa Family" (つばさファミリー). The second Monogatari saga, released between 2010 and 2011, delves further in Koyomi's relationship with each of the heroines, including a second Nekomonogatari volume, subtitled Shiro (白, "White") containing "Tsubasa Tiger" (つばさタイガー); Kabukimonogatari (傾物語, "Slope Story") containing "Mayoi Jiangshi" (まよいキョンシー); Hanamonogatari (花物語, "Flower Story") containing "Suruga Devil" (するがデビル); Otorimonogatari (囮物語, "Decoy Story") containing "Nadeko Medusa" (なでこメドゥーサ); Onimonogatari (鬼物語, "Demon Story") containing "Shinobu Time" (しのぶタイム); and Koimonogatari (恋物語, "Love Story") containing "Hitagi End" (ひたぎエンド). The third Monogatari saga, released between 2012 and 2014, deepens the history of the character Ōgi Oshino, a supposed relative of Meme Oshino. It is composed of six volumes; Tsukimonogatari (憑物語, "Possess Story") containing "Yotsugi Doll" (よつぎドール), Koyomimonogatari (暦物語, "Calendar Story"), containing 12 short stories, three volumes of Owarimonogatari (終物語, "End Story") containing "Ōgi Formula" (おうぎフォーミュラ, Ōgi Fōmyura), "Sodachi Riddle" (そだちリドル, Sodachi Ridoru), "Sodachi Lost" (そだちロスト, Sodachi Rosuto), "Shinobu Mail" (しのぶメイル, Shinobu Meiru), "Mayoi Hell" (まよいヘル, Mayoi Heru), "Hitagi Rendezvous" (ひたぎランデブー, Hitagi Randebū) and "Ōgi Dark" (おうぎダーク, Ōgi Dāku), and Zoku-Owarimonogatari (続・終物語, "Continued End Story") containing "Koyomi Reverse" (こよみリバース, Koyomi Ribāsu). The fourth Monogatari saga, released between 2015 and 2017, contains sidestories focusing on various characters. The first book is Orokamonogatari (愚物語, "Fool Story"), containing "Sodachi Fiasco" (そだちフィアスコ), "Suruga Bonehead" (するがボーンヘッド) and "Tsukihi Undo" (つきひアンドゥ). The second book is Wazamonogatari (業物語, "Karma Story") containing "Princess Fair" (うつくし姫, Utsukushihime), "Acerola Bon Appétit" (あせろらボナペティ, Aserora Bonapeti), "Karen Ogre" (かれんオウガ, Karen Ouga) and "Tsubasa Sleeping" (つばさスリーピング, Tsubasa Surīpingu). The third book is Nademonogatari (撫物語, "Nadeko Story") containing "Nadeko Draw" (なでこドロー, Nadeko Dorō). The fourth book is Musubimonogatari (結物語, "Last Story") containing "Zenka Mermaid" (ぜんかマーメイド, Zenka Māmeido), "Nozomi Golem" (のぞみゴーレム, Nozomi Gōremu), "Mitome Wolf" (みとめウルフ, Mitome Urufu) and "Tsuzura Human" (つづらヒューマン, Tsuzura Hyūman). The fifth and current Monogatari saga, whose first book was released in 2017, follows Koyomi's life as a university student. The first book is Shinobumonogatari (忍物語), containing "Shinobu Mastered" (しのぶマスタード, Shinobu Masutādo). The second book is Yoimonogatari (宵物語), containing "Mayoi Snail" (まよいスネイル, Mayoi Suneiru) and "Mayoi Snake" (まよいスネイク, Mayoi Suneiku). The third book is Amarimonogatari (余物語), containing "Yotsugi Body" (よつぎボディ, Yotsugi Bodi) and "Yotsugi Shadow" (よつぎシャドウ, Yotsugi Shadou). The fourth book is Ōgimonogatari (扇物語), containing "Ōgi Light" (おうぎライト, Ōgi Raito) and "Ōgi Flight" (おうぎフライト, Ōgi Furaito). The fifth and final book, divided into two volumes is Shinomonogatari (死物語), containing "Deathtopia Destiny" (ですとぴあデスティニー, Desutopia Desutinī), "Deathtopia Destination" (ですとぴあデスティネーション, Desutopia Desutinēshon) and "Deathtopia Death Education" (ですとぴあデスエデュケーション, Desutopia Desu Edyukēshon). Vertical has licensed the novels for English release. The company released Kizumonogatari on December 15, 2015, and released the Bakemonogatari novels in three volumes; the first being released in December 2016, the second in February 2017, and the third in April 2017. The first volume of Nisemonogatari was released in June 2017 and the second in August 2017. The anime adaptation of Bakemonogatari aired between July 3 and September 25, 2009 on Tokyo MX. The series is part of Kodansha's Nisio Isin Anime Project and is produced by Shaft, directed by Akiyuki Shinbō with assistance from Tatsuya Oishi, written by Fuyashi Tō and featuring a character designs by Akio Watanabe based on Vofan's original concepts. The music for the series is produced by Satoru Kōsaki under the supervision of Yota Tsuruoka. The series was scheduled to be 15 episodes long, but only the first 12 episodes were broadcast. The remaining three episodes were distributed on the official website between November 3, 2009 and June 25, 2010. At Sakura-Con 2012, Aniplex of America announced that they had acquired Bakemonogatari for a North America release. The series was released in North America on Blu-ray on November 20, 2012. An 11-episode anime adaptation of Nisemonogatari aired from January 8 to March 18, 2012, produced by the same staff as Bakemonogatari. A four-episode anime television series adaptation of Nekomonogatari (Kuro) (猫物語(黒), "Cat Story (Black)") aired back-to-back on December 31, 2012. Two Blu-ray and DVD compilation volumes were released: the first on March 6, 2013 and the second on April 3, 2013. A 26-episode anime television series titled Monogatari Series Second Season, spanning five of the six novels from Nekomonogatari (Shiro) (猫物語(白), "Cat Story (White)") to Koimonogatari, aired between July 7 and December 29, 2013. A five-episode anime television series, adapting the remaining novel of the second series, Hanamonogatari, aired as a marathon on August 16, 2014, and a four-episode adaptation of the first novel of the third series, Tsukimonogatari, which falls chronologically between Monogatari Series Second Season and Hanamonogatari, aired in a marathon on December 31, 2014. A 12-episode anime television series adapting two more novels of the third series, titled Owarimonogatari, aired between October 3 and December 19, 2015. A series of three films adapting the prequel novel Kizumonogatari were produced, with the first one, Kizumonogatari Part 1: Tekketsu, premiering on January 8, 2016, the second film, Kizumonogatari Part 2: Nekketsu, premiering on August 19, 2016, and the third and final film, Kizumonogatari Part 3: Reiketsu, premiering on January 6, 2017. A web anime series adapting Koyomimonogatari became available for download on the App Store and Google Play from January 9, 2016. A seven-episode anime television series, an adaptation of the third Owarimonogatari novel, aired on August 12 and 13, 2017. An adaptation of Zoku Owarimonogatari was released in theaters on November 10, 2018 and as two Blu-ray and DVD volumes on February 27, 2019 and March 27, 2019. It will air on TV as six episodes between May 18 and June 22, 2019. On January 10, 2018, NisiOisin announced via Twitter that Bakemonogatari would receive a manga adaptation. On February 13, 2018, Kodansha revealed three pieces of character art and opened a contest for Twitter users to guess the identity of the artist who would illustrate the series. On February 28, 2018, it was announced that manga artist Oh! great would be illustrating the series. The manga launched in the 15th issue of Kodansha's shōnen manga magazine Weekly Shōnen Magazine on March 14, 2018. 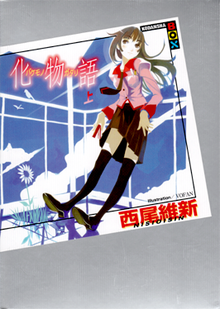 The special edition of the first volume contained a short prose story by NisiOisin and a short manga titled "Bake 'mono' gatari" (化“者”語)[a] by Oh! great. The manga will be released in North America by Vertical in October 2019. A drama CD titled Original Drama CD Hyakumonogatari (オリジナルドラマCD　佰物語, Orijinaru Dorama Shīdi Hyakumonogatari), a reference to the parlor game Hyakumonogatari Kaidankai, was released on August 3, 2009. The script was written by Nisio Isin and is bundled with the CD. A PlayStation Portable visual novel titled Bakemonogatari Portable (化物語 ポータブル) developed by Bandai Namco Games was released on August 23, 2012. Good Smile Company has made several nendoroid petit figures for the series, releasing them as separate sets. The first set contains the characters Koyomi Araragi, Hitagi Senjōgahara and Tsubasa Hanekawa. The second set contains Suruga Kanbaru, Mayoi Hachikuji and Nadeko Sengoku and the third set contains the Araragi sisters Karen and Tsukihi, as well as Shinobu Oshino. The company also made a line of separate, 1/8 scale figures of Hitagi Senjōgahara, Suruga Kanbaru, Nadeko Sengoku, Tsubasa Hanekawa, Mayoi Hachikuji, Karen Araragi, Tsukihi Araragi, Shinobu Oshino, Kiss-Shot Acerola-Orion Heart-Under-Blade (from Kizumonogatari), Nadeko Sengoku in her Medusa form, and Yotsugi Ononoki. They have also made figma figures of several of the characters: Koyomi Araragi, Hitagi Senjōgahara, Mayoi Hachikuji, Suruga Kanbaru, Nadeko Sengoku, and Tsubasa Hanekawa. They have planned to make the Araragi sisters, Karen and Tsukihi. Alter, Bandai, Kotobukiya, and others have made figures of some of the other characters as well. The light novel series ranked sixth in the 2009 issue of Takarajimasha's light novel guide book Kono Light Novel ga Sugoi!. It later went on to rank as high as second in 2010. Koyomi Araragi ranked sixth in the Best Male Character in 2009, second in 2010, seventh in 2011, third in 2012, and sixth in 2013. Meanwhile, Hitagi Senjōgahara ranked seventh in the Best Female Character in 2009, fourth in 2010, eighth in 2011, and seventh in 2012. The anime adaptation won the Users' Special Award in the 2nd annual DEG Japan Awards/Blu-ray Prizes. Over one million DVDs and BDs of Bakemonogatari and Nisemonogatari have been sold combined. ^ The title is spelled with the kanji character 者 (mono) meaning "person", rather than the character 物 (mono) meaning "thing", as used in the title of the Bakemonogatari (化物語) novel. ^ "Bakemonogatari: Monster Tale". Vertical, Inc. Archived from the original on August 25, 2018. Retrieved January 20, 2018. ^ 化物語（上） [Bakemonogatari (Vol. 1)] (in Japanese). Kodansha. Retrieved October 1, 2014. ^ 化物語（下） [Bakemonogatari (Vol. 2)] (in Japanese). Kodansha. Retrieved October 1, 2014. ^ a b 概要 [Outline] (in Japanese). Shaft. Retrieved October 6, 2009. ^ 傷物語 [Kizumonogatari] (in Japanese). Kodansha. Retrieved October 1, 2014. ^ 偽物語（上） [Nisemonogatari (Vol. 1)] (in Japanese). Kodansha. Retrieved October 1, 2014. ^ 偽物語（下） [Nisemonogatari (Vol. 2)] (in Japanese). Kodansha. Retrieved October 1, 2014. ^ "Kizumonogatari by Nisio Isin". Penguin Random House. Retrieved February 26, 2016. ^ "Vertical's First "Bakemonogatari" Novel Previewed - Release Dates For Upcoming Volumes Listed". Crunchyroll. November 6, 2016. Retrieved December 21, 2016. ^ "NISEMONOGATARI, 1". Barnes & Noble. Retrieved December 21, 2016. ^ "Nisemonogatari, 2 by Nisio Isin". Penguin Random House. Retrieved January 13, 2017. ^ ひたぎクラブ (in Japanese). Shaft. Retrieved October 6, 2009. ^ "NisiOisin's Bakemonogatari Light Novels to Get Anime". Anime News Network. April 4, 2008. Retrieved August 28, 2008. ^ "Bakemonogatari Anime Promo Video Posted". Anime News Network. March 18, 2009. Archived from the original on 21 March 2009. Retrieved March 18, 2009. ^ スタッフ・キャスト [Staff & cast] (in Japanese). Shaft. Retrieved October 6, 2009. ^ "Bakemonogatari Anime Promo Video Streamed". Anime News Network. Retrieved July 3, 2009. ^ "Aniplex of America Adds Bakemonogatari TV Anime". Anime News Network. Retrieved 6 April 2012. ^ "Bakemonogatari Blu-ray Complete Set (S) Limited Edition". The Right Stuf International. Archived from the original on February 1, 2013. Retrieved September 16, 2012. ^ a b "Nekomonogatari (Black) Anime's Promo Streamed". Anime News Network. December 7, 2012. Retrieved December 7, 2012. ^ "NisiOisin's Nekomonogatari (Black) Anime to Air on TV". Anime News Network. September 26, 2012. Retrieved September 26, 2012. ^ "Monogatari 2nd Season to Run for 1/2 Year Starting in July". Anime News Network. January 7, 2013. Retrieved January 7, 2013. ^ "Luna Haruna Sings Monogatari Series 2nd Season Anime's Ending". Anime News Network. May 22, 2013. Retrieved May 22, 2013. ^ "Monogatari Series' Hanamonogatari Delayed Until August 16". Anime News Network. May 13, 2014. Retrieved May 13, 2014. ^ "Monogatari Series' 1st 'Final Season' Anime to Air on December 31". Anime News Network. October 21, 2014. Retrieved October 21, 2014. ^ "Kizumonogatari Confirmed as 3 Films Starting on January 8". Anime News Network. October 3, 2015. Retrieved October 6, 2015. ^ "2nd Kizumonogatari Film Opens in Japan Next Summer". Anime News Network. December 21, 2015. Retrieved January 26, 2016. ^ "Kizumonogatari II Film Slated for August 19". Anime News Network. June 28, 2016. Retrieved June 28, 2016. ^ "3rd Kizumonogatari Film Slated for January 6". Anime News Network. August 18, 2016. Retrieved August 18, 2016. ^ ""Koyomimonogatari" Short Anime to be Available from January 9, 2016". Crunchyroll. December 12, 2015. Retrieved December 20, 2015. ^ "New Owarimonogatari Anime Adapts 3rd Novel Volume in Summer". Anime News Network. Retrieved March 25, 2017. ^ "Owarimonogatari Anime Special Previewed in Video". Anime News Network. June 30, 2017. Retrieved June 30, 2017. ^ Hodgkins, Crystalyn (September 21, 2018). "Zoku Owarimonogatari Anime Reveals TrySail Ending Theme, November 10 Debut". Anime News Network. Retrieved September 21, 2018. ^ Hodgkins, Crystalyn (February 10, 2019). "Monogatari Series Rebroadcast Takes Over Sword Art Online: Alicization Anime's Timeslot Starting on April 6". Anime News Network. Retrieved February 10, 2019. ^ a b Pineda, Rafael Antonio (January 10, 2018). "NisiOisin's Bakemonogatari Novel Gets Manga in March". Anime News Network. Retrieved August 9, 2018. ^ Komatsu, Mikikazu (February 14, 2018). "Can You Guess Who The Illustrator for "Bakemonogatari" Manga Adaptation is?". Crunchyroll. Retrieved August 9, 2018. ^ April (February 28, 2018). "Air Gear Artist 'Oh! great' Revealed as Bakemonogatari Manga Artist". Anime News Network. Retrieved August 9, 2018. ^ a b Pineda, Rafael Antonio (May 16, 2018). "Bakemonogatari Manga's 1st Volume Bundles Short Story by NisiOisin". Anime News Network. Retrieved August 9, 2018. ^ Sherman, Jennifer (March 13, 2019). "Kodansha Comics, Vertical Add Bakemonogatari, Cells at Work! Code Black, Granblue Fantasy Manga". Anime News Network. Retrieved March 13, 2019. ^ "化物語（１）". Kodansha (in Japanese). Retrieved August 9, 2018. ^ "化物語（１）特装版". Kodansha (in Japanese). Retrieved August 9, 2018. ^ "化物語（２）". Kodansha (in Japanese). Retrieved August 9, 2018. ^ "化物語（２）特装版". Kodansha (in Japanese). Retrieved August 9, 2018. ^ "化物語（３）". Kodansha (in Japanese). Retrieved November 6, 2018. ^ "化物語（３）特装版". Kodansha (in Japanese). Retrieved November 6, 2018. ^ "化物語（４）". Kodansha (in Japanese). Retrieved April 5, 2019. ^ "化物語（４）特装版". Kodansha (in Japanese). Retrieved April 5, 2019. ^ "化物語（５）". Kodansha (in Japanese). Retrieved April 5, 2019. ^ "化物語（５）特装版". Kodansha (in Japanese). Retrieved April 5, 2019. ^ オリジナルドラマCD　佰物語 [Original Drama CD Hyakumonogatari] (in Japanese). Kodansha. Retrieved January 10, 2016. ^ ジャンル検討中の『化物語 ポータブル』が8月23日に発売! 豪華6大特典が付く限定版も (in Japanese). ASCII Media Works. February 24, 2012. Retrieved August 7, 2012. ^ "青春をPSPで妄想し――プレイヤーの想像が創造につながる『化物語 ポータブル』のプレイレポを掲載!" (in Japanese). ASCII Media Works. August 22, 2012. Retrieved August 23, 2012. ^ "Nendoroid Petite: Bakemonogatari Set #1". Good Smile Company. Retrieved August 8, 2012. ^ "Nendoroid Petite: Bakemonogatari Set #2". Good Smile Company. Retrieved August 8, 2012. ^ "Nendoroid Petite: Bakemonogatari Set #3". Good Smile Company. Retrieved August 8, 2012. ^ "Hitagi Senjougahara". Good Smile Company. Retrieved August 8, 2012. ^ "Suruga Kanbaru". Good Smile Company. Retrieved August 8, 2012. ^ "Nadeko Sengoku". Good Smile Company. Retrieved August 8, 2012. ^ "Tsubasa Hanekawa". Good Smile Company. Retrieved August 8, 2012. ^ "Mayoi Hachikuji". Good Smile Company. Retrieved August 8, 2012. ^ "Karen Araragi". Good Smile Company]]. Retrieved August 9, 2018. ^ "Tsukihi Araragi". Good Smile Company]]. Retrieved August 9, 2018. ^ "Tsukihi Araragi: Alternate Color ver". Good Smile Company]]. Retrieved August 9, 2018. ^ "Shinobu Oshino". Good Smile Company. Retrieved August 8, 2012. ^ "Kiss-Shot Acerola-Orion Heart-Under-Blade". Good Smile Company]]. Retrieved August 9, 2018. ^ "Nadeko Sengoku: Medusa Ver". Good Smile Company]]. Retrieved August 9, 2018. ^ "Yotsugi Ononoki". Good Smile Company]]. Retrieved August 9, 2018. ^ "Yotsugi Ononoki DX". Good Smile Company]]. Retrieved August 9, 2018. ^ "figma Koyomi Araragi". Good Smile Company. Retrieved August 8, 2012. ^ "figma Hitagi Senjougahara". Good Smile Company. Retrieved August 8, 2012. ^ "figma Mayoi Hachikuji". Good Smile Company. Retrieved August 8, 2012. ^ "figma Suruga Kanbaru". Good Smile Company. Retrieved August 8, 2012. ^ "figma Nadeko Sengoku". Good Smile Company. Retrieved August 8, 2012. ^ "figma Tsubasa Hanekawa". Good Smile Company. Retrieved August 8, 2012. ^ "Ponyo, Bakemonogatari, Conan Win Japanese BD Prizes". Anime News Network. February 18, 2010. Archived from the original on 20 February 2010. Retrieved February 19, 2010. ^ "第2回「DEGジャパン・アワード/ブルーレイ大賞」受賞作品発表｜DEGジャパン" (in Japanese). deg-japan.jp. Retrieved February 19, 2010. ^ "1+ Million Bakemonogatari/Nisemonogatari DVD/BDs Sold". Anime News Network. September 25, 2012. Retrieved September 26, 2012. This page was last edited on 17 April 2019, at 18:38 (UTC).